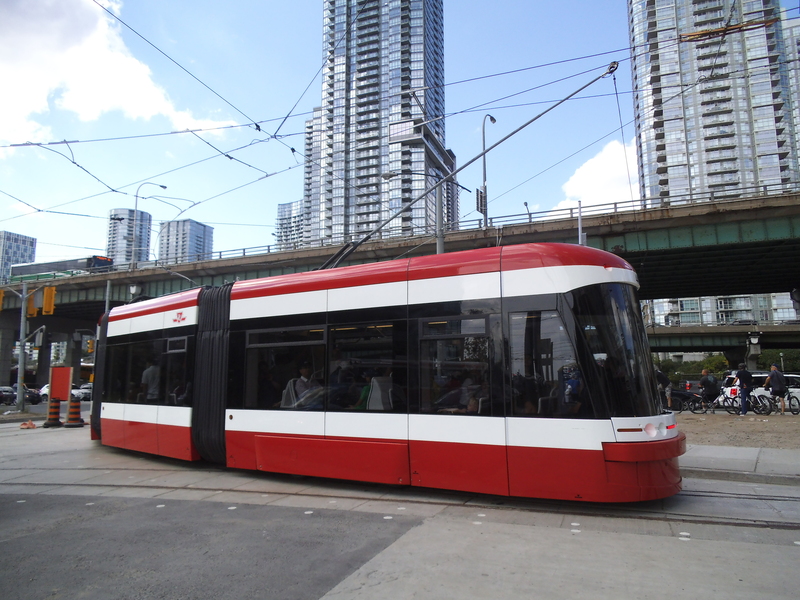 On August 31st, 2014 the Toronto Transit Commission (TTC) entered their new Flexity Outlook streetcars into service along their 510 Spadina Line. Two of their new cars, #4400 and #4403, operated along Spadina Avenue between Spadina Station and Queen’s Quay. 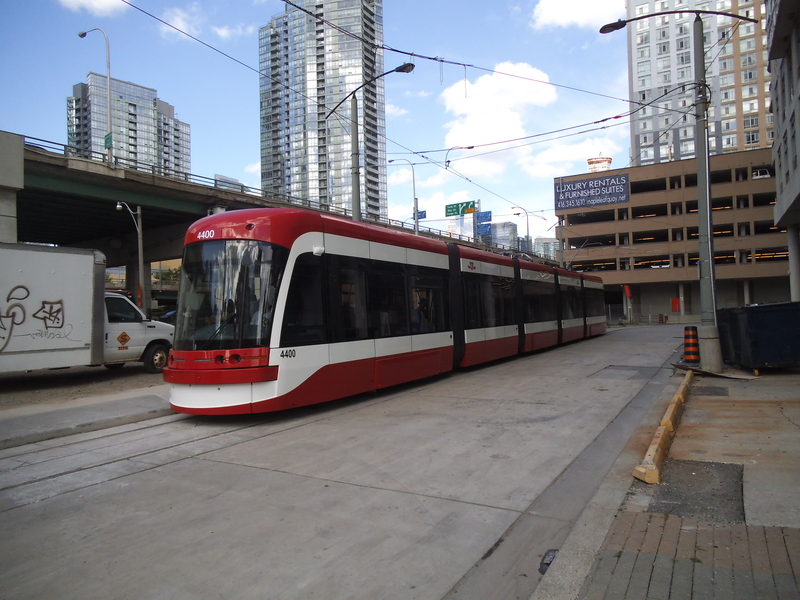 The new cars, the first two of the 204 that the TTC has on order, will continue to operate along Spadina Ave. Other new streetcars will enter service as they arrive and will eventually expand to all their routes. The TTC has announced that it will take up to five years for them to fully implement the new fleet and retire their current Canadian Light Rail Vehicle (CLRV) and Articulated Light Rail Vehicle (ALRV) some of which entered service back in the late 1970s. The new streetcars are twice the length of the current CLRV and can seat 70 people and 181 standees for a maximum of 251 passengers per streetcar. The new streetcars have five sections and four doors. 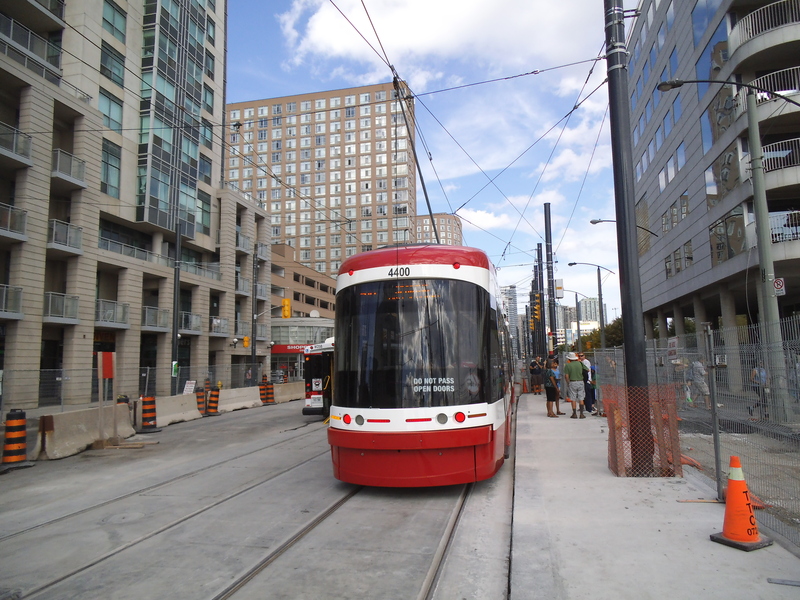 The TTC will be using a Proof-of-Payment (POP) system for the Flexity Outlook streetcars allowing passengers to enter and exit through all the doors and not force passengers to enter only through the front door as with the current streetcar fleet. The new streetcars will also require the TTC to switch from using a trolley pole to using a pantograph. The first several streetcars will use a trolley pole, but over the coming years, the entire streetcar system will be changed over to allow for pantographs. #4400 waiting to head north on Spadina Ave.
#4400 turning north onto Spadina Ave.
Toronto can now officially welcome their new streetcars in town. 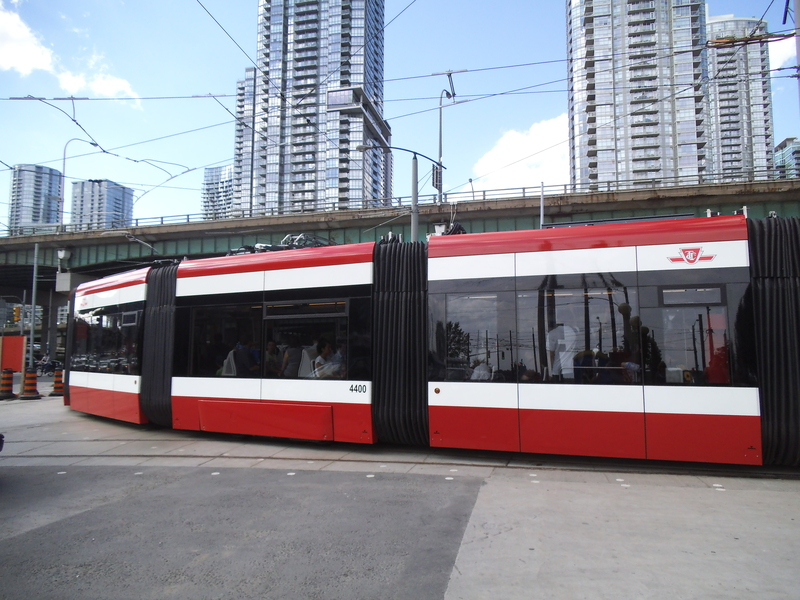 This entry was posted in General and tagged 510 Spadina, Articulated Light Rail Vehicle, Canadian Light Rail Vehicle, Flexity Outlook, Queens Quay, Spadina Avenue, streetcar, Toronto, Toronto Transit Commission, TTC. Bookmark the permalink.